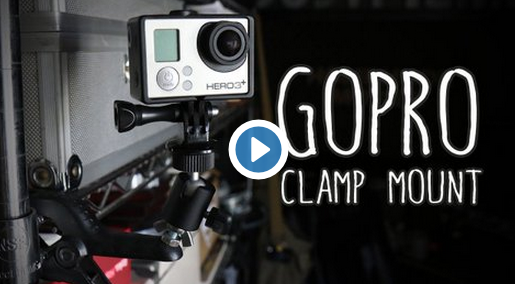 It’s no secret that GoPro has revolutionized the way we take pictures and video. It’s also become a serious filmmaking and TV camera for use to document the action from angles you couldn’t ever get from a RED DRAGON or ARRI ALEXA. But there are times where putting a HERO somewhere requires a specific mount, and GoPro charges $50 for a clamp that will allow you to put them anywhere. 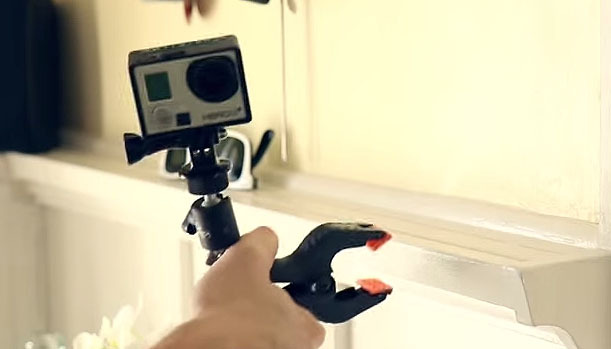 I have one, and the’re pretty great, but if I want to use multiple cameras on a shoot, the cost will mount up, that is, until one of our favorite YouTubers came up with a simple $10 solution. You may recall Dustin McLean, formerly of Homemade Movies. We did a doddleTALKS Tech episode with him last year, where he talked about the tools he uses on set to recreate iconic scenes from movies, shot-for-shot. One of those tools was the GoPro HERO, which Dustin used for all his behind the scenes b-roll. 1 – plastic hand clamp from the $.99 Store (they come sets of two). This part is specific because it already has pilot holes for drilling through to attach other parts, and also adjustable pads to keep the clamp level. And they’re cheap! 2 – Ball Head mount. This is where your mileage may vary, but Dustin found the ball head tripod mount on Amazon for around $6-8. You can get them cheaper, and have them all plastic, but they do end up wearing out faster. The metal ones that come from overseas are the idea combination of low cost and tougher design. 5 – 1 wing nut. First thing you do, is you take a ¼ drill bit and with your drill, you auger out the pilot holes that are already in the clamp. Be careful here because you don’t want to crack the plastic. But once you drill it out, it’s the ideal size for the machine screw. Slip the screw through the hole from the inside of the clamp and then secure it with the nut. You’re going to want to tighten this down pretty good and this is where the machine screws that have the philips head grooves comes in handy. Once tightened, you want to screw on the wing nut – UPSIDE DOWN, so the wing part is facing towards the clamp itself. This will make sense in a second. Next, you add the ball head tripod mount. Once you screw that on, you want to then back the Wing nut up against it until tight. These will work against one another and prevent the ball head from loosening. 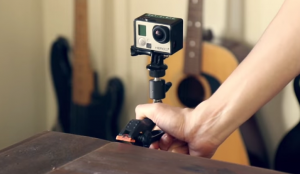 Lastly, you screw on the GoPro Tripod Mount adapter. And you are done! Total cost … less than $10. You can pay more or less, depending on parts. For instance, I ordered my Tripod mount adapters on eBay for .99 a piece, rather than the $3 on Amazon or from GoPro. I’ll have to wait a few days longer, but so what? I have one to get me through shooting for the next few days, and then I’ll be making at least two more (I have three GoPros, afterall). Below is Dustin’s video, so you can see how he builds it step by step. Also, check out his page, give him a subscribe and a thumbs up.